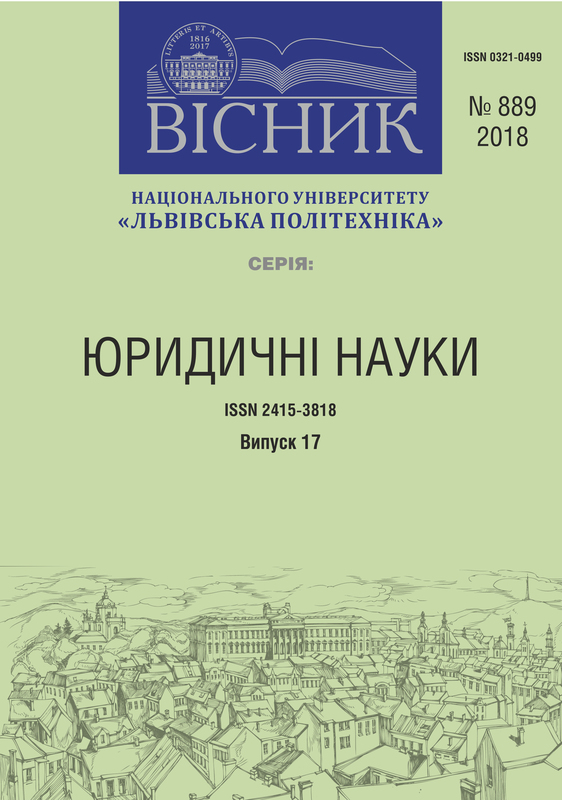 The article examines aspects of observance of labor rights of women in Ukraine based on the decisions of the European Court of Human Rights and national courts in this category of cases. It focuses on gender discrimination as one of the main causes of violation of labor rights of women. Тhe article attempts to determine the peculiarities of the legal proceeding of labor disputes, where one side is a female employee. The present study provides own approaches to solving a given issue. 1. Oplata pratsi ta sotsial'no-trudovi vidnosyny u II kvartali 2017 roku. [Labor and social and labor relations in the 2nd quarter of 2017]. Available at : www.ukrstat.org/uk/druk/publicat/ kat_u/publ11_u.htm. 2. Case of Emel Boyraz v. Turkey [Case of Emel Boyraz v. Turkey]. Available at: www.hudoc.echr.coe.int/eng?i=001-148271. 3. Konventsiya pro zakhyst prav lyudyny i osnovopolozhnykh svobod vid 04.11.1950 r. (red. vid 01.06.2010 r.) [Convention for the Protection of Human Rights and Fundamental Freedoms of 04.11.1950 (as amended on 01.06.2010)]. Available at: www. zakon3.rada.gov.ua/laws/show/995_004. 4. Sprava “Zhovner proty Ukrayiny” vid 29.06.2004 r. [The case "Zhovner v. Ukraine" dated 29.06.2004]. Available at: www. zakon2.rada. gov.ua/laws/show/980_221. 5. Sprava “Vorotnikova proty Ukrayiny” vid 14.02.2008 r. [Case “Vorotnikov v. Ukraine” dated February 14, 2008]. Available at: www.zakon3.rada.gov.ua/ laws/show/974_353. 6. Cprava “Lipisvits'ka proty Ukrayiny” vid 12.05.2011 r. [Law Firm “Lipisvitska v. Ukraine” dated May 12, 2011]. Available at: www. zakon3.rada.gov.ua/laws/show/974_648. 7. Zakon Ukrayiny “Pro torhovo-promyslovi palaty v Ukrayini” vid 02.12.1997 r. (red. vid 01.01.2016 r.). [Law of Ukraine “On Chambers of Commerce and Industry in Ukraine” of 02.12.1997 (as of 01.01.2016)]. Available at: www. zakon5.rada.gov.ua/laws/show/671/97-vr. 8. Zaochne rishennya Dniprovs'koho rayonnoho sudu m. Dniprodzerzhyns'ka Dnipropetrovs'koyi oblasti vid 27.10.2016 r. u spravi No. 209/623/16-ts. [An emergency decision of Dniprovsky district court of Dneprodzerzhinsk, Dnipropetrovsk region, dated October 27, 2016 in case number 209/623/16-ts.]. Available at: www.reyestr.court.gov.ua/Review/62358695. 9. Rishennya Shevchenkivs'koho rayonnoho sudu m. Kyyeva vid 09.06.2016 r. u spravi No. 761/5458/16-ts. [Decision of the Shevchenkivsky District Court of Kyiv dated June 9, 2016 in case No. 761/5458/16-t.]. Available at: www.reyestr. court.gov.ua/Review/58440977. 10. Postanova Khersons'koho okruzhnoho administratyvnoho sudu vid 21.08.2010 r. u spravi No. 2-a-13412/09/2170. [Resolution of the Kherson Regional Administrative Court dated August 21, 2010 in the case No. 2-a-13412/09/2170.]. Available at: www.reyestr.court.gov.ua/Review/11350168. 11. Rishennya Kolomyys'koho mis'krayonnoho sudu Ivano - Frankivs'koyi oblasti vid 25.10.2016 r. u spravi No. 346/4492/16-ts. [Decision of the Kolomyia City Court of Ivano-Frankivsk Oblast dated October 25, 2016 in case No. 346/4492/16-t.]. : www.reyestr.court.gov.ua/Review/62204025. Zabolotna N., Tsyliukova I. "Urrent standards of women's labor rights in Ukraine, using the example of judicial practice". http://science.lpnu.ua/law/all-volumes-and-issues/volume-5-number-889-17-2018/urrent-standards-womens-labor-rights-ukraine.